The screenshot below indicates a download box where you enter all your links. You may enter filehost links here, and you may also enter MAGNET links (for torrents; more on that later) here. The system will automatically differentiate and process these as needed. If the screenshot(s) above are confusing, do not worry. This section will explain the different types of download modes available on RPNet and how each of them functions. For most content sources we support, you will be able to enter links and download the resulting links that our system gives you. However, you have other options for some hosts, while these alternative options may be forced for some hosts. Please click the links above to learn more about each of the download mode. If applicable, the help section will also contain helpful screenshots. Not all content sources that we support allow unlimited use. We do not have a monthly fair use limit for accounts. Instead, we implement a daily limit for certain content sources that are either difficult to work with or severely limit data for us. You can get a live overview of current limits by visiting the Limits page in your UserCP. While most decent download managers should have no problems running with RPNet, since our generated links are no different from regular/direct HTTP links, there are some download managers that we've tried and tested and recommend. Besides fetching content from various third party sources, RPNet also allows you to download torrents. You can enter MAGNET links to a torrent in the Download box and RPNet's dedicated torrent servers will download the torrent for you (provided the torrent is healthy and has enough seeders and/or seeders with the full file) and let you download the contents of that torrent as one convenient .zip file (or browse the directory) via HTTP. We realize the increasing need for users' privacy and anonymity, and keeping that in mind, RPNet also offers a proxy and VPN service. Our proxy and VPN service is complimentary, and entails no extra charges at this time. The extent of the service is modest, but functional and works very well for a lot of our users. At RPNet, we believe in rewarding our users for their loyalty. Keeping that in mind, we've developed a bonus and an affiliate system. The bonus system rewards you for logging in every day; once every 24 hours, you can claim a random bonus ranging from extra download quota (applicable to any b/w limited host) to bonus premium time. And if you feel that our service is up to your standards and would like to recommend it to your friends, we also have an affiliate system. Not only do you earn points for referring qualified users (the points can be used for extra premium time), but your referred users will also earn points if they sign up using your invitation code. Downloads Listing Type: This is a UI (User Interface) preference option that allows you to choose between the way your generated links/downloads are listed on the My Downloads pages. You can choose between seeing grids (default) or a classic table listing. 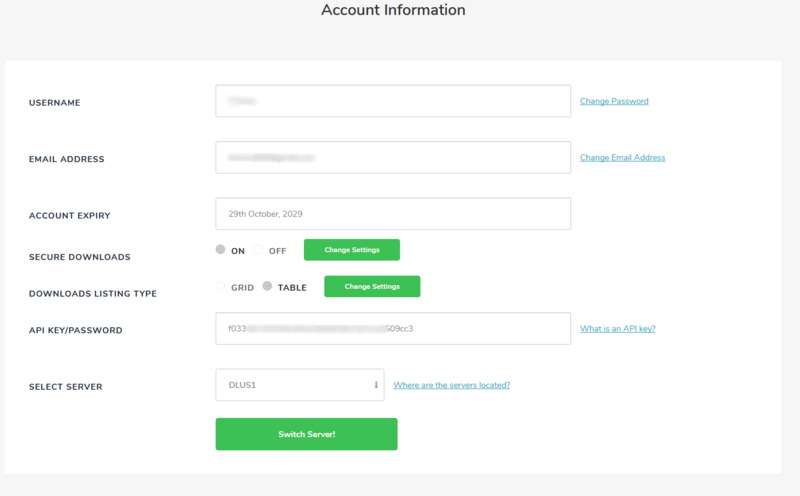 Server Switch: This allows you to switch your account between one of our available download servers. Based on your location, you can pick one that is closest to you for faster data transfers. After registering your account with us, you will need to renew it/activate it before you can use our services as a premium user. After registration, please proceed to the Renew Account page to find one of many available payment options that you can use to quickly pay and activate your account for premium use. We realize that while this startup guide contains an overall review of all the features we offer, there may be times when you need more information and/or wish to report a problem or a bug in the system. We're very receptive to all client communication and we love to hear feedback from you. If you have any trouble with RPNet, please do not hesitate to get in touch with us directly. This helpdesk is how we assist our users.